Tow Results Large numbers of 2-year-old scallops portend an abundant adult population in 3 years time. The pictured scallops were part of a single tow in the Hudson Canyon Closed Area that returned 13,000 juvenile scallops. Seed Scallops These small scallops of 5 to 15 millimeters in diameter are about one year old. Seed Scallops Because the smaller, year-old scallops are more susceptible to predation, their large numbers don’t guarantee a corresponding increase in future adult populations. But the presence of large numbers of two-year-old scallops is encouraging, as these have a reasonable chance of growing to adult size. Recent surveys by researchers at the Virginia Institute of Marine Science reveal an unprecedented number of young scallops in 2 fishery management areas off the mid-Atlantic coast. The high levels of scallop “seed” should generate significant commercial catches in 3 years, when the scallops are 5 years old. That’s good news for the continued success of the Atlantic sea scallop fishery, a model of effective collaboration among scientists, resource managers, and commercial fishing interests that now sustains the most valuable wild scallop fishery in the world. U.S. scallop landings totaled $455.1 million in 2010 (latest available data), with 15% of those dollars accruing to Virginia. Scallopers in the Commonwealth landed $70.2 million worth of the tasty bivalves in 2010, 35% of the total value of Virginia’s seafood landings for the year. 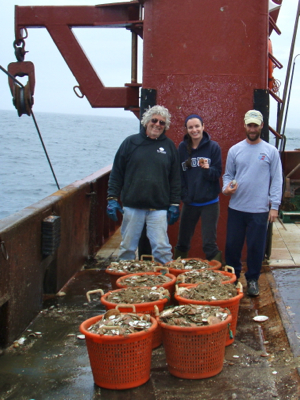 The VIMS surveys are part of the Sea Scallop Research Set-Aside Program, a unique component of the Atlantic Sea Scallop Fishery Management Plan in which commercial scallopers each year set aside proceeds from a portion of their “Total Allowable Catch” to fund scallop-related research. This year’s set aside is for 1.25 million pounds. VIMS emeritus professor Bill DuPaul, a key figure in establishing the scientist-scalloper partnership in the mid-1980s, says “Scallops are currently valued at $9.35 per pound, so this year’s set-aside will fund more than $10 million of research.” The research is administered through a competitive grant program managed by the National Marine Fisheries Service with input on research priorities from industry advisors. VIMS scientists, led by Dr. David Rudders of the Marine Advisory Services program at VIMS, successfully competed for 5 set-aside grants this year, earning funds to conduct high-resolution monitoring surveys in offshore scallop-management areas from Virginia to New England. The VIMS surveys provide the population data needed to determine the abundance and health of adult and juvenile scallops within several offshore zones that are managed on a rotating basis. 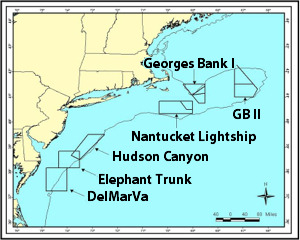 These so-called “closed areas”—the DelMarVa, Elephant Trunk, Hudson Canyon, Nantucket Lightship, and Georges Bank I and II—are opened to fishing when surveys show a sufficient adult population, and closed when the adult population falls below a pre-defined threshold or when surveys show a large number of young scallops. Restricting access to the juvenile seed scallops allows scallopers to take advantage of the bivalve’s rapid growth between 3 and 5 years of age, when the animals more than double in weight. By waiting, the scallopers get more meat per shell and a more profitable product. The team’s reports of unprecedented numbers of seed scallops come from the first pair of this year’s 5 scallop-monitoring surveys. The first survey took place between April 18-26 within the DelMarVa Closed Area aboard the F/V Stephanie B II out of Seaford, Virginia. The second took place from May 4-9 within the Hudson Canyon Closed Area aboard the F/V Kathy Ann out of Barnaget Light, New Jersey. DuPaul notes that the team “observed a record-breaking number of scallop seed in both closed areas, including a tow in the northern part of the Hudson Canyon Closed Area that returned more than 13,000 seed.” To put that in perspective, says Rudders “Anything over 100 seed scallops per tow is pretty good, anything above 1,000 is excellent, and anything above 10,000 is remarkable." He adds, "in the course of the work that has been done at VIMS, this was certainly the most seed scallops over a wide area that we have ever observed." Because the smaller, year-old scallops are more susceptible to predation, their large numbers don’t guarantee a corresponding increase in future adult populations. But the presence of large numbers of 2-year-old scallops is encouraging, as these have a reasonable chance of growing to adult size. The team’s next survey begins this week, when they plan to embark from New Bedford, Massachusetts aboard the F/V Celtic for a weeklong trip to the Nantucket Lightship Closed Area. Their 2 remaining surveys will take place later this spring within the northern part of Georges Bank Closed Area II and the inshore areas west of the Hudson Canyon Closed Area. The official reports that are generated from the team's 2012 scallop surveys will be presented and reviewed at the August meeting of the New England Fishery Management Council Scallop Plan Development Team. The results will be used for scallop management in 2013 and 2014. Previous reports are available from the Hargis Library at VIMS.